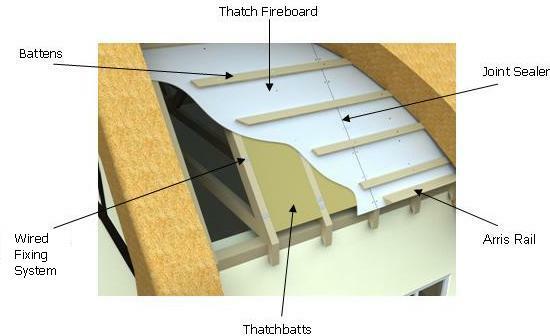 The TAS – Thatch Fireboard System is designed to meet the performance criteria of The Dorset Model. The combination of TAS100 Thatch Fireboards for Integrity and Thatchbatts® for Insulation makes this system an ideal fire protection solution, with the added benefit of providing the required thermal insulation values. The Thatch Fireboard System will offer a fire barrier in accordance with BS476: Part 3: 2004 & CEN/TS 1187:2012, test 4 and is recognised as a Local Authority Building Control (LABC) Registered System. The system, which can be found on the LABC registered details database, has proved compliance with building regulations and standards across the UK. The LABC database contains various products and systems, which once certified, are accepted by building control surveyors in over 300 local authorities. This assures the construction industry that a product or system has been rigorously checked by LABC surveyors. Fireboard has been selected as part of this system to meet the recommendations of the Dorset Model. Therefore this system is normally used for new builds and extensions that are 12m or less from the boundary, as detailed in Building Control Approved Document B. 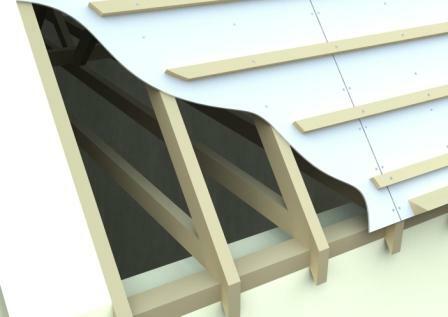 This system can also be used on existing buildings or those that may have been subjected to a new roof following a fire, providing the roof timbers are straight and strong enough to take the fireboards. Thatchbatts® are used as part of the system in relation to fire resistance from an insulation perspective. This product is a non-combustible, semi-rigid, high quality resin bonded mineral rockwool, which makes it ideally suited for use within the construction of a thatched roof, due to offering zero spread of flame and good thermal transfer properties. If the Thatchbatts® are installed at the same depth as the roof timbers, then the fire resistance is increased in terms of reducing the area of charring to the roof timbers. Therefore, helping to protect the roof structure from either a fire on the outside or on the inside. Every thatched roof and associated structure is different, some properties have loft spaces and some have either part or full vaulted ceilings. Therefore the requirements for internal finishes to include any requirements for additional insulation and vapour control layers will vary. Note: Not installing correct levels of insulation can increase the risk of condensation. Consideration should also be given to the provision of a suitable vapour control layer (VCL), the type and location will depend on the layout of the living space within the property. The Fireboards are positioned on top of the roof rafters with the smooth side facing upwards and fixed down with appropriate fixings. When fixing the boards, the first row is normally laid out horizontally along the eaves and then working towards the ridge, each subsequent row of fireboard is laid in a way so the joints are staggered. Please view TAS100 Fireboard for more information. All joints need to be sealed with a bead of intumescent joint sealant by means of a caulking gun. Ensure all joints are clean, dry and free from grease. Do not apply when rain or frost are imminent. The application temperature should be +5°C to +30°C. Thatchbatts® have been manufactured to be friction fitted between the rafters set at 400mm centres. When using multiple layers of Thatchbatts®, the joints should be staggered to give a more comprehensive solution. Please view Thatchbatt® for more information. In addition to the Thatchbatts® being friction fitted we also recommend that our stainless steel wiring system is used to provide additional support for the slabs. Many other components will be used to make up the complete roof, to include the likes of thatch, battens, vapour controls layers and internal finishes such as plaster. One of the most important areas to focus on is the control of vapour in the form of selecting the most suitable vapour control layer (VCL) and the correct location in the property. Although this evaluation process should apply to all properties that are considering the installation of fireboards, it is particularly relevant to new builds and fire damaged properties during the drying out process. Please view U-Value & Condensation Reports for more information. Please consult your architect or building control officer with regard to the required insulation values and the need for a vapour control layer (VCL). 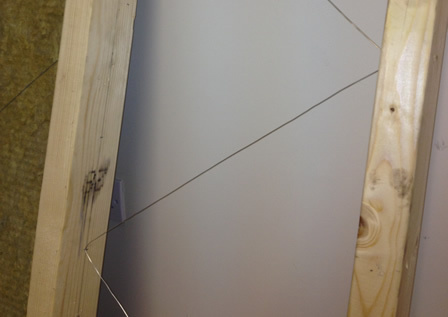 All the framing and substances must comply with relevant Building Regulations and Standards. All components of this system should be installed in a professional like manner and in strict accordance with our instructions. The materials should be kept in a dry and frost free environment before and during installation. Prior to thatching works taking place, the materials should be protected from the elements at all times. The components within the Thatch Fireboard System contribute to a part of the overall roof construction. Therefore please consult with your Architect with regard to the performance of the complete roof structure, to include requirements for other components such as vapour control layers etc. 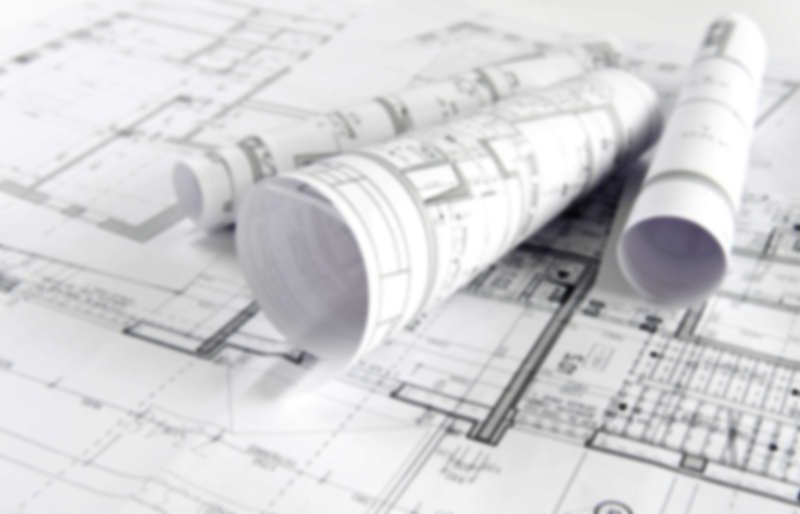 It is the responsibility of the end-user or his/her agent to gain any necessary permissions in the form of conservation/preservation orders or listed building consents in relation to using any of the products, designs or recommendations listed in this document. All products are supplied with Installation Instructions, which will need reviewing before completing any works. please contact us on 08455 20 40 60.